I garden on the eastern prairie and one of my greatest joys is watching the numerous hummingbirds that visit my gardens flit from one flower to the next sipping all the nectar they can enjoy. That’s why I love to add hummingbird friendly plants to my garden. RED ROCKS® Penstemon is not only a favorite of hummingbirds, but the rabbits and deer that stomp through my garden don’t bother them. RED ROCKS® Penstemon is a 1999 Plant Select® introduction and is a hybrid of Mexican and California species. The 15 inch tall plant has glossy, narrow, green foliage and the slender stalks of large tubular rose pink flowers sport a white throat. 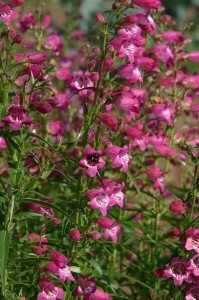 It flowers through the summer, unlike many other penstemon that flower in early summer. Deadheading prolongs the flowering however, I always leave a few flower stalks toward the end of the season so my plants can reseed. These plants can be short lived because of their floriferous nature. Welcoming the little seedlings ensures that you always have this colorful penstemon in your garden. I like to plant RED ROCKS® Penstemon with smaller ornamental grasses such as little bluestem (Schizachyrium scoparium) and Mexican feather grass (Nassella tenuissima). Perennials such as Geranium ‘Rozanne’, Gaura ‘Snow Fountain’, Indian blanket flower (Gaillardia sp. ), purple coneflower (Echinacea purpurea) and various coreopsis varieties blend well with the rosy pink penstemon to brighten your flower beds and extend the season of bloom. RED ROCKS® Penstemon is tolerant of many soil types and does extremely well in a free-draining loamy soil in a sunny location. Although somewhat xeric, RED ROCKS® Penstemon does flower more profusely with moderate watering and is hardy to USDA Zone 4 and up to 7,000 feet. In my books, it’s a real winner! Thanks to Lina Fletcher, Tagawa Gardens for this piece.